Some additional details on the map are in this article from the National Archives: The 200th Anniversary of the Survey of the Coast. 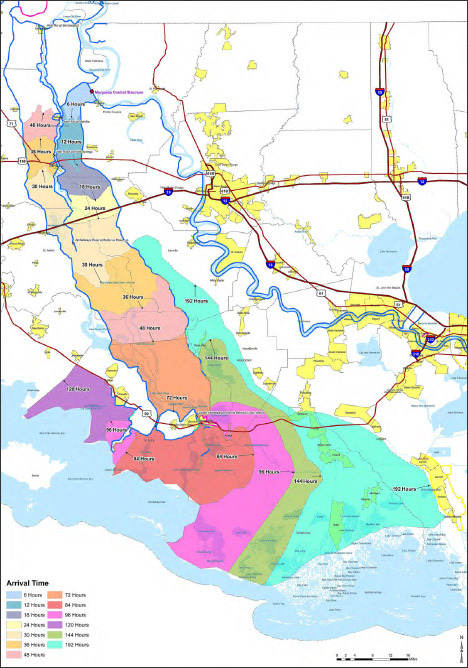 Sticking to the flood theme, here’s a recent map from the U.S. Army Corps of Engineers showing the predicted travel time for water in the Morganza Floodway. Brewer, Cynthia A. 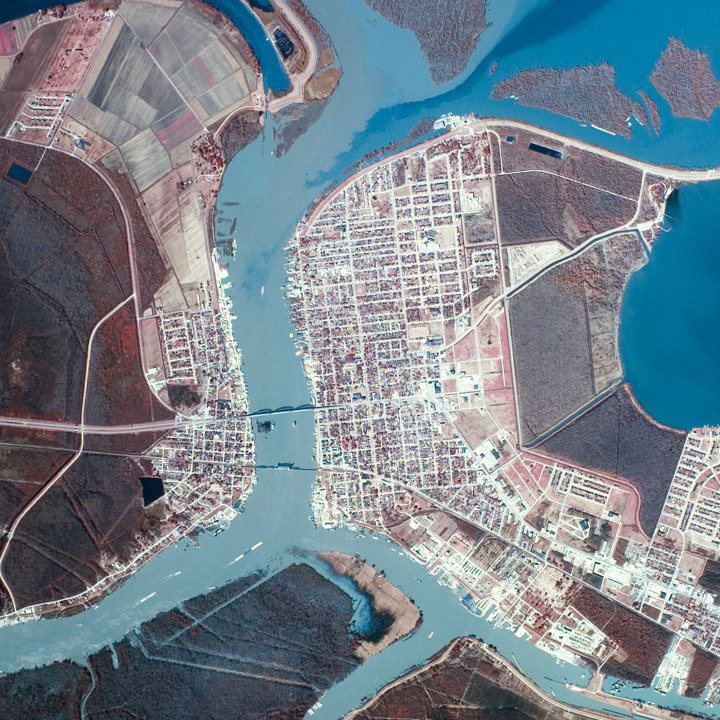 (2005) Designing Better Maps: A Guide for GIS Users. 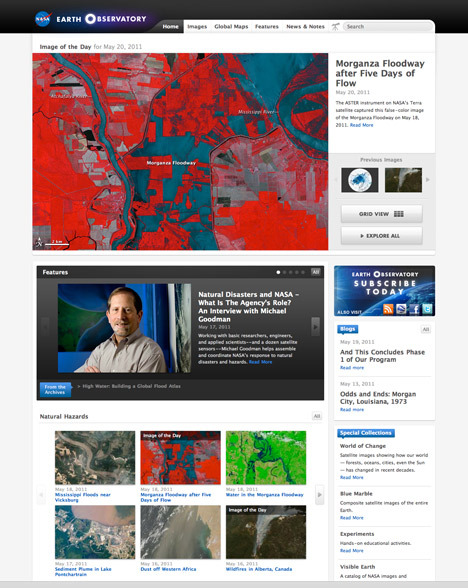 Redlands, CA: ESRI Press. MacEvoy, Bruce. (2008) Watercolors. 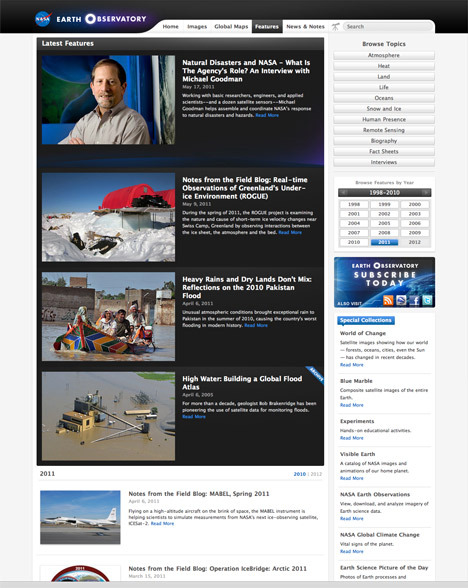 Accessed April 28, 2008. Rogowitz, B.E. ; Treinish, L.A. (1998) Data visualization: the end of the rainbow, Spectrum, IEEE , vol.35, no.12, pp.52-59. Tufte, Edward R. (1990) Envisioning Information. Cheshire, CT: Graphics Press. Ware, Colin. (2005) Information Visualization, Second Edition. San Francisco, CA: Morgan Kaufmann. 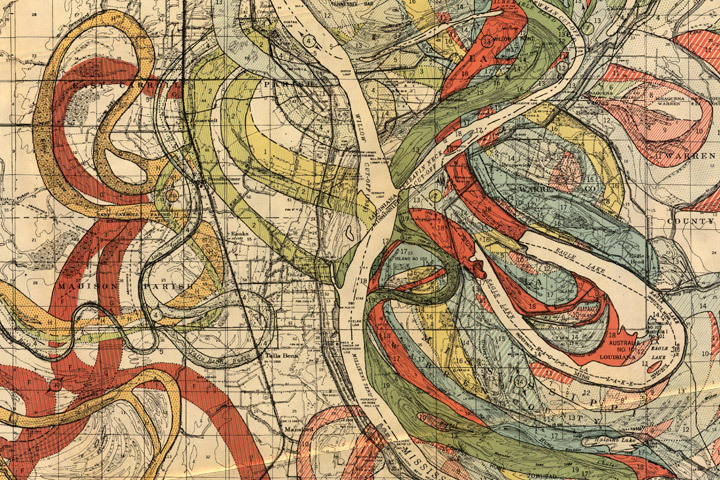 Historic flooding along the Mississippi River gives me an excuse to show another of my favorite maps, from Geological Investigation of the Alluvial Valley of the Lower Mississippi River. Each color represents an old channel, dating back 1,000 years or so. Those that correspond to historical records are dated, while older channels are ordered according to the principle of superposition (newer sediments on top of older ones). 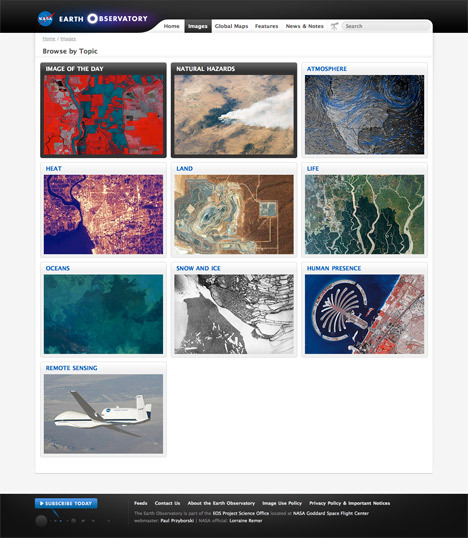 Many of the surface layers are still visible in satellite imagery. 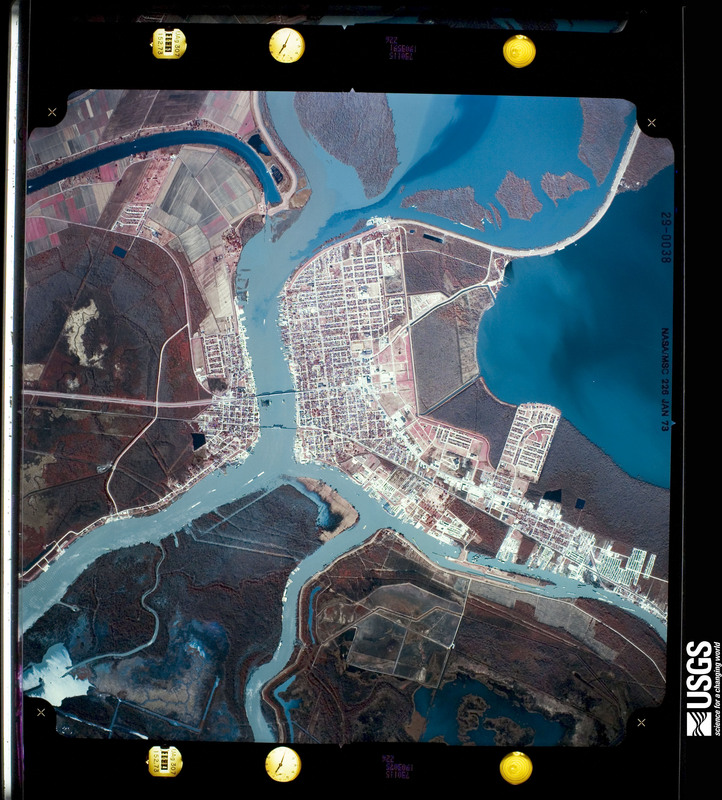 High-resolution, geolocated maps from Cairo to the Gulf, along with major tributaries, geological maps, and cross sections, are distributed by the U.S. Army Corps of Engineers. Since I was (slightly) critical of the New York Times graphics department yesterday, I’ll show a Times map that is one of my favorite visualizations today: a map of shaking intensity and slip during the 1906 San Francisco Earthquake. The New York Times version both has more data and is more readable. Why? First off, the Times uses a subdued, discrete, color palette that shifts through a small range of hues. This allows other information to be layered into the map. 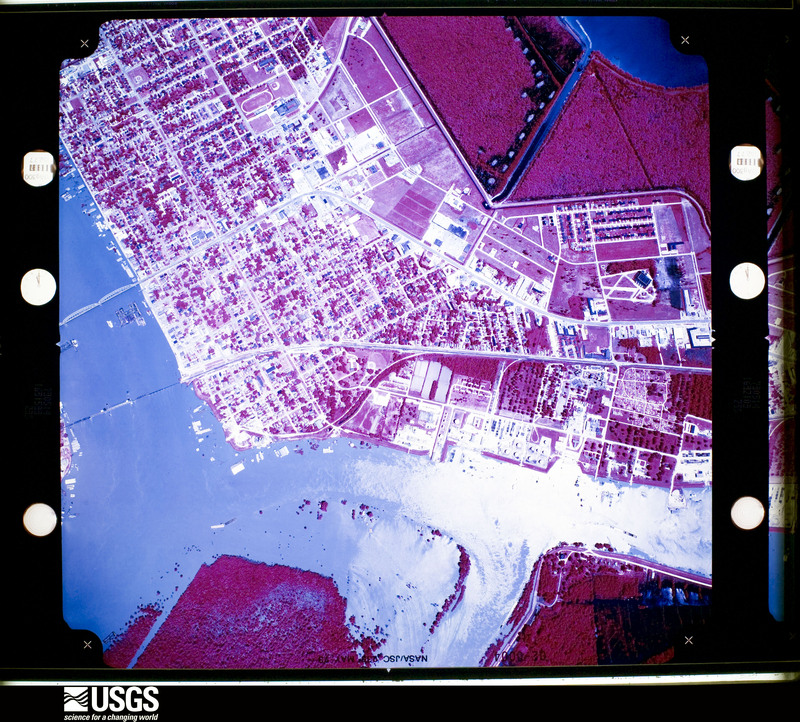 The USGS, in contrast, uses a rainbow of hues at maximum saturation. The rainbow palette [at some point I’m going to do series of posts on color palettes, but for now i’ll just point to Color Brewer to explain the importance of appropriate color maps in data visualization] uses the full spectrum and is so saturated that there are very few colors left over for additional data—notice how the red fault lines on the USGS map disappear in areas of intense shaking. The dark ocean in the USGS version also competes visually with the data-rich areas of the map. 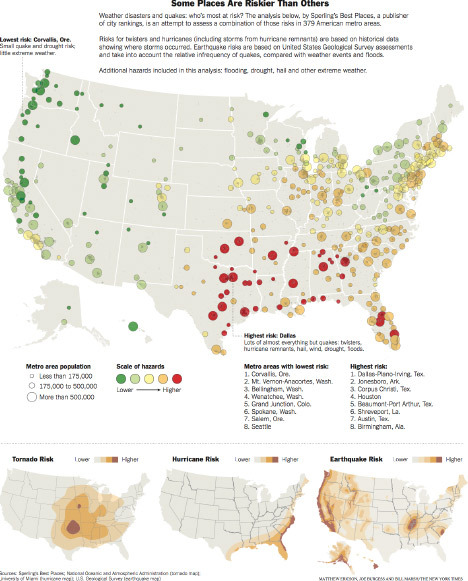 The New York Times also forgoes the use of terrain data in their map. 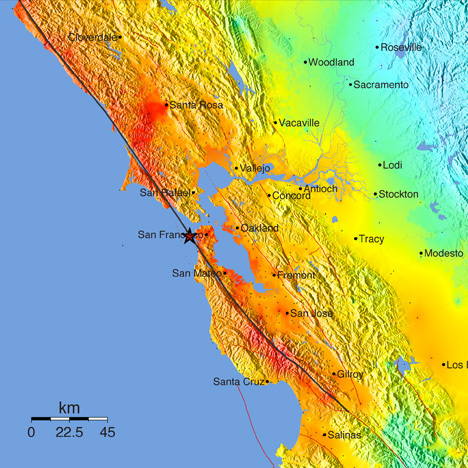 It adds a lot of great context to the image (the San Andreas creates a distinct valley), but at web resolutions shaded relief is very difficult to pull off. The high frequency contrast distracts from the other data in the map. At larger sizes, or printed at high resolution, the terrain could be added back in (but it still needs to be treated carefully—see Relief Shading for advice). 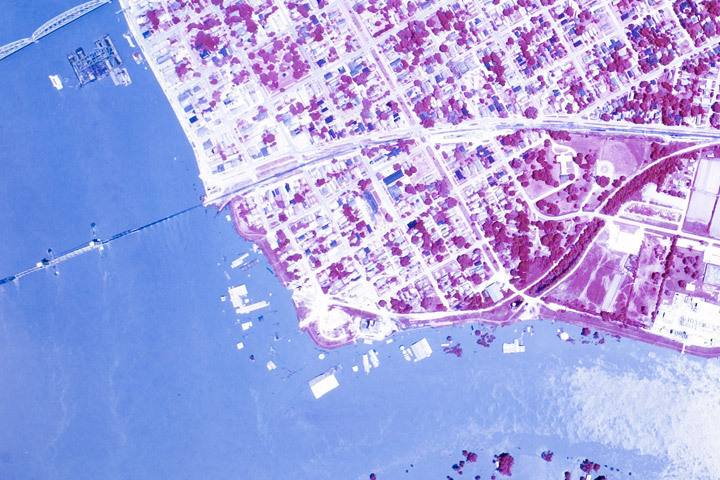 As a result, fine details in the faults and the boundaries of urban areas remain legible. 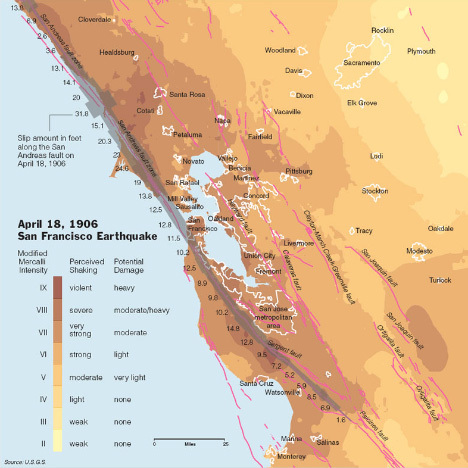 My favorite part of the Times map is the inclusion of the amount of slip at various locations on the San Andreas: it’s so much more informative than merely indicating the epicenter. Earthquakes—especially big earthquakes—aren’t points. They occur over a two dimensional area (reduced to a one dimensional quantity on this map). Increased slip correlates with increased shaking, which tells a story. That’s what makes this map so powerful. It’s a narrative of cause and effect, which is a quality of the best data visualizations. The map has many of the design virtues common in graphics from the Times (clean, focused on the data, clearly labeled, small multiples), but when I first viewed it I had trouble parsing the data. It took me a while to figure out that hazard was indicated by color, and the size of each circle denoted ancilliary information (population). I suspect I’m not the only person who would consider the size of the circles more important than the color, and assume size was correlated with hazard. I had to carefully read the key to figure out the proper way to read the map. Perhaps using size to encode hazard, and color (or opacity, or icons) for population would have worked better. I recently had the opportunity to attend & give a presentation at the 2011 International Symposium on Remote Sensing of the Environment in lovely Sydney, Australia. (OK, not so recently—the conference ended on the April 15th. I blame jetlag.) Just over 60 people turned up for the talk, which was mostly about our visualization of Eyjafjallajökull. (Which means I had to attempt to learn how to pronounce “Eyjafjallajökull.” Luckily I don’t think anybody made it from Iceland to Sydney to critique me.) If you’re interested, I’ve posted Keynote and PDF copies (originally prepared for last years’s fall AGU). 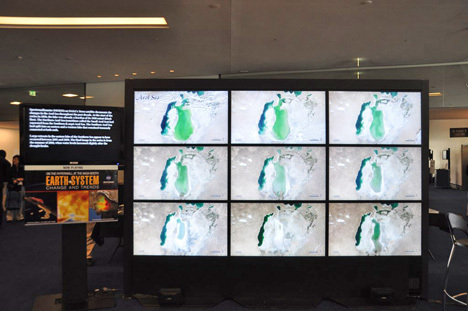 Compare the small multiples on the hyperwall with the sequential display of the same images from the Earth Observatory’s World of Change. During my talk I promised the audience that I’d update the blog more frequently, so there should be more posts in the future. I sometimes struggle for good ideas, so if you have a suggestion, please drop a note in the comments.